Moffitt Library, located next to Memorial Glade, is one of the busiest campus libraries with undergraduate course reserves, computer lab, makerspace, media center, copy center, campus classrooms, and convenient access to the research collections in the Main (Gardner) Stacks. Moffitt floors 4 & 5, accessed through the east entrance are open 24 hours during the fall and spring semester and are snack and drink friendly. 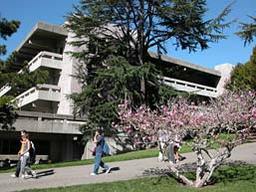 Reserved for UC Berkeley students and faculty, Moffitt serves students of all majors and is open the longest hours. Campus visitors are welcome at the Free Speech Movement (FSM) Café and popular Newspaper Display Wall near the 3rd floor south entrance. Moffitt Library is wheelchair accessible. Assistive technology is provided in the library. Accommodations are available for nursing mothers registered through the Berkeley Breastfeeding Support Program. Nancy Tran is the library contact for students with disabilities.